Lieutenant-General Ranbir Singh, India’s Director-General of Military Operations (DGMO), said the strikes, which took place “along the Line of Control” caused “significant damage” but offered no further details. 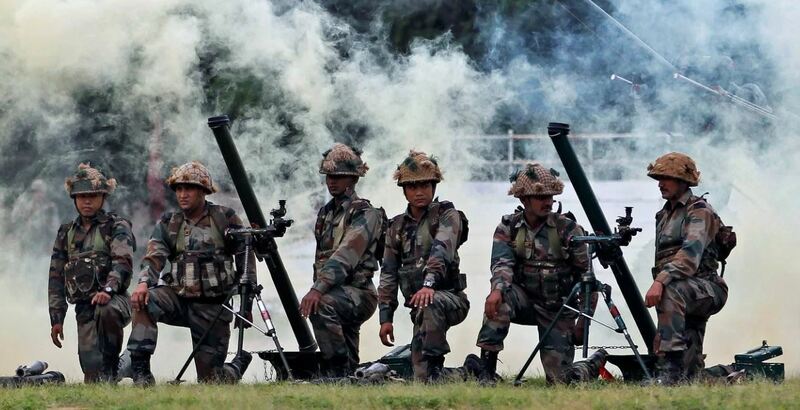 The Indian army struck along a giant arc on the Line of Control early this morning, staging what it described as “surgical strikes” on terrorist launch-pads inside Pakistan-occupied Kashmir (PoK). Lieutenant-General Ranbir Singh, India’s Director-General of Military Operations (DGMO), said the strikes, which took place “along the Line of Control” caused “significant damage” but offered no further details. In military textbooks, a “surgical strike” refers to an attack that causes damage to its intended target not to a mode of assault. Pakistan’s military said that two of its soldiers were killed when troops “exchanged fire across the Line of Control” in an engagement which began at 2:30 a.m. and ended at 8:00a.m. In a later statement, it denied any strikes had taken place across the Line of Control (LoC), claiming instead that there had been “cross-border fire initiated and conducted by India which is an ‘existential phenomenon’’. General Singh’s statement left open the possibility that India may have used artillery or anti-tank missiles to precision-target terrorist launching positions without risking troops in a mission across the Line of Control. Kel and Lipa are both known to be significant launching stations for the Lashkar-e-Taiba (LeT) and other terrorist groups where small units of jihadists gather near military forward posts for the last stage of their journey across the LoC into northern Kashmir. Bhimber, similarly, is a major axis of infiltration into Rajouri and Poonch. India and Pakistan had agreed to a ceasefire along the Line of Control in 2003, following the India-Pakistan military crisis that followed the Jaish-e-Muhammad’s attack on Parliament House on December 13, 2001. However, efforts to arrive at a formal signed agreement stalled in 2006, following disputes over the rules governing new defensive fortifications. Ever since the long jihad in Kashmir began in 1989, troops on both sides of the LoC have been locked in an often-savage secret war which General Singh’s press conference has for the first time brought out into the open. History suggests that the fighting on Thursday is unlikely to mark the end of the story. While 2016 has been the most peaceful year on the LoC in a decade, the ceasefire had been fraying steadily since Lance-Naik Hem Raj and Lance-Naik Sudhakar Naik were beheaded in a jihadist strike in January 2013, amidst a surge in infiltration backed by the Pakistan Army. The fighting that began in 2013 had its genesis in events of October 2012 when Pakistan complained of new Indian border work at Charunda in Uri. India responded that the work were purely defensive, intended to prevent illegal border crossings. The unresolved dispute led to exchanges of fire, which eventually escalated into shelling and the killings of soldiers on both sides. Late in July 2013, Pakistan complained that “unprovoked” Indian fire had led to the death of Sepoy Asim Iqbal in the Nazia Peer sector near the town of Rawlakote. India, however, said the firing began in response to an infiltration attempt.